Though a dehydrator is more common and much easier to make beef jerky with, Smoke Grill BBQ isn't about doing things the easy way. We see making food, especially over an open flame, a hobby that is worth the time and effort to do it right. It's that moment when you put something in your mouth to taste it and think you are at a restaurant that make it all worth it. 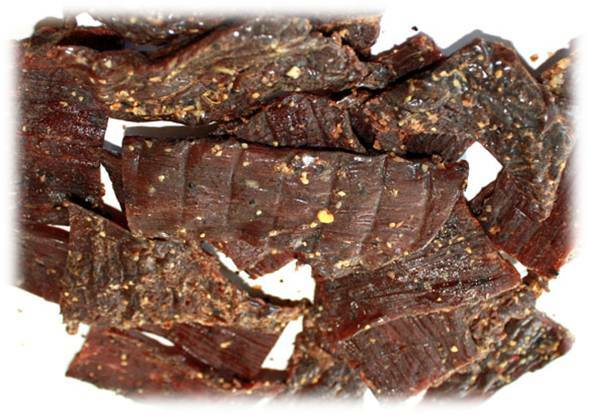 This beef jerky recipe calls for a few extra steps than using your typical dehydrator to make jerky that will help season the meat with a smoky flavor that liquid smoke just can't replicate. It calls for smoking the meat for 3 hours before finishing it off in the kitchen in the dehydrator. Feel free to use our recommended seasoning mix or buy one at any specialty store. Start by marinating your beef all of the ingredients in the refrigerator for 4-8 hours. This will help the seasoning further penetrate the meat and result in a more flavorful jerky. Light your smoker and let it come to a low temperature of 160-180 degrees Fahrenheit. Remember that most meat you smoke is typically 200-225 degrees, so make sure you turn down the smoker or use less charcoal for making jerky. As your smoker heats up to temperature, strip out your meat into small pieces. You can strip it by using a meat/jerky gun or by using a rolling pin and cutting strips by hand. Cut strips to about 1/4 an inch thick by 1 inch wide. Put your jerky on the smoker for 3 hours. It is easy for the meat to stick on the grill so using a foil pan with cooking spray is the best method to help pull the strips off the smoker. Just make sure the strips are not stacked on top of one another as they need to be surrounded with the heat and smoke in order to cook and season properly. Line your dehydrator with beef jerky strips and keep it in the dehydrator for another 5-6 hours. This timing will depend on a number of factors, so just make sure you check your jerky before pulling it off. To check the strips to see if they are done, let a piece cool, then bend it in half. It should be pliable in the center but the edges should break off. You can store your beef jerky in the freezer and keep fresh for up to a year.